A few weeks ago I told you that we were getting ready to Celebrate Cinderella by having a Royal Ball. To get ready for our ball we did all sorts of things! We had our gowns pressed, purchased all of our goodies for our wonderful guests, and even attended some perfectly princess events. 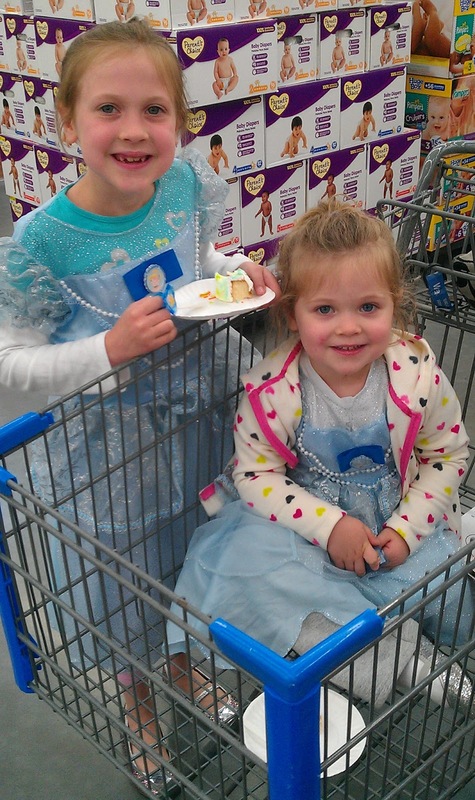 One of the events was the Disney Cinderella Retailtainment Event at our local Walmart. It was a cold and windy day so Princess MG and Princess Mads had to dress in layers. At the event we received coloring sheets and cake. The cake was SO good! We also purchased the recently re-released Cinderella Blu-Ray/DVD to watch at our upcoming Royal Ball. We also downloaded the Royal Ball app (you can find it in your app store here or here). We had so much fun with the app! You get to create beautiful ensembles, choose your crown, design your carriage and attended a Royal Ball! You can also unlock other outfits and bring your carriage to life by scanning select images in your local Walmart. The girls have had a blast with this app, they of course love the dancing the best. You can also take a picture of yourself in your newly created ensemble and share the pic right from your phone, or send it to your local Walmart to be printed! So awesome! Party day had finally arrived and we were all so excited! We invited 16 girls to the party, 12 RSVP'd and 4 attended the Royal Ball. We were having terrible weather the day of the party, but we still had a BLAST! The girls colored, decorated cookies, put on a Disney Princess Fashion Show, danced and watched Cinderella. I am pretty sure they all had a really good time because there were tons of giggles and smiles. We also ate tons of yummy treats! You can't have a Royal Ball without treats! The Chocolate Dipped Marshmallows were definitely a hit! I also made cupcakes and punch. The girls took candy, stickers, bracelets, candy, crowns, rings, candy and gumballs home in their treat bags. Before the girls left, they begged me to have another Royal Ball. I promised we would, maybe in the spring. I don't usually throw parties at my house, I really despise the clean-up, but I am so glad we had this Royal Ball! I am a member of the Collective Bias™ Social Fabric® Community. This shop has been compensated as part of a social shopper insights study for Collective Bias™ and Disney Consumer Products, Inc. #CBias #SocialFabric All opinions are my own.